Chinese people celebrate the new year during a countdown event at a Yongdingmen Gate in China's capital Beijing, Dec. 31, 2017. As China begins a new year, the big question for its economy is whether government leaders will stick to their promises to control financial risks and rely on "high-quality" growth. The twin policy pledges, frequently repeated by President Xi Jinping and Premier Li Keqiang, imply that the government will curb credit emissions and be satisfied with slower but more sustainable economic growth. Policymakers and regulators faced the identical issues at the start of 2017, but their performance before the critical 19th National Congress of the Communist Party of China (CPC) in October was decidedly mixed. Under pressure to deliver on the CPC's promise to double gross domestic product in a decade by 2020, the government looked the other way while state-owned banks let loose a wave of new loans. In September, net new lending of 1.27 trillion yuan (U.S. $193 billion) topped forecasts, rising 16.5 percent from a month earlier and sparking expectations that loans would hit a new high in 2017. New loans fell back in October but then surged again in November to 1.12 trillion yuan (U.S. $169.3 billion), setting a record for the 11-month period, according to Reuters reports. Most of the credit was for home and property financing, boosting speculation in the high-growth investment sector that the People's Bank of China (PBOC) had promised to control. Despite the government's focus on new-age factors, including technology, innovation, consumption and services, to drive the economy, the lending gave an old-fashioned push to construction-related industries to underpin growth. The official Xinhua news agency acknowledged the backsliding in a year-end economic report. "China has maintained prudent monetary policy since 2011. However, in practice the policy has been loosening slightly due to downward pressure on economic growth," Xinhua said. The loans have defied repeated warnings in the past year from the International Monetary Fund about the "dangerous" pace of credit increases, as well as a downgrade of China's sovereign debt in September from Standard & Poor's ratings agency. In the latest frictions last month, an IMF review of China's financial stability criticized its rising credit levels and complexity of the country's system. The fund cited banking practices such as lending to prop up growth and employment, and compensating investors for losses from risky financial products. IMF officials said that "credit growth will not slow sustainably unless tolerance for job losses and slower economic growth rises, particularly at (the) local level, and new sources of revenue are found for local governments." The PBOC responded that the assessments "have fully acknowledged China's achievements" in promoting financial stability, but cited "a few descriptions and views in the reports that we don't agree with." The government continued to rely on lending to boost GDP growth to 6.9 percent through the first three quarters of last year, topping both Premier Li's target of "about 6.5 percent" for last year and the 6.7-percent expansion in 2016. Aside from clashes with the IMF and rating agencies, the loan binge also contradicted China's own official policy goals for 2018, which stress risk reduction, credit cutoffs for "zombie" enterprises, support for the "real economy," and slower but steadier growth. "Achieving high-quality development is imperative for China to maintain sustainable and healthy development of the economy and society," President Xi said on Dec. 6, according to Xinhua. Policymakers echoed the same themes at the annual Central Economic Work Conference in Beijing last month. A statement issued at the end of the three-day conference appeared to downplay the need for deleveraging, suggesting tolerance for increases in debt. "Prudent monetary policy should be kept neutral, the floodgates of monetary supply should be controlled, and current and social financing should see reasonable growth," the statement said. "China will maintain a hardline stance on irregular and illegal activities in the financial industry to forestall risks," it said. But the conference statement quickly drew attention for what it did not say. "Compared with the statement from last year, analysts have noticed the absence of 'deleveraging' in the wording," Xinhua said in a year-end commentary on Dec. 21. The news agency cited a research note from China International Capital Corp., arguing that although deleveraging was not mentioned, "financial risk control is still a priority." The lukewarm assurance is unlikely to be seen as an adequate response to calls for more urgent action to restrain credit growth. "Since October, Chinese economic policymakers have expressed little interest in tackling the country's mountain of debt, which has accumulated rapidly over the past decade," The New York Times said. China's challenge this year is not whether it will set sound goals, but whether it will ignore them again and fall back on credit-fueled stimulus policies if economic growth slips too fast or too far. One consideration working in favor of sustainable risk and growth policies is that China no longer needs such high rates to fulfill the CPC promise of doubling GDP by 2020. The steady and relatively high growth maintained through November has created "room for policymakers to step up efforts on risk control, poverty relief and pollution next year," Xinhua argued in a report on Dec. 14. In a Xinhua report on Dec. 23, an official of the government's central leading group on financial and economic affairs, said the goal of doubling GDP could be met with annual growth of 6.3 percent through 2020. "Judging from current economic performance, there will not be any huge barrier in meeting the goal," said Yang Weimin, deputy director of China's Office of the Central Leading Group on Financial and Economic Affairs, which is in charge of leading and supervising the economic work of both the CPC Central Committee and the State Council. Scott Kennedy, deputy director of China studies at the Center for Strategic and International Studies in Washington, said in September that China's leaders appeared comfortable with even lower growth in the range of 5.8 percent to 6.2 percent for 2018-2020 as they pursue their priority for managing risks. 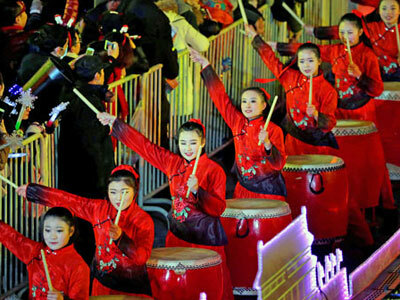 "My sense is that the government is likely to encourage a slightly looser monetary policy for the next couple of months to ensure China gets safely through the Spring Festival without hiccups, but reducing financial risks will still be the top priority for the coming year," Scott said by email last month, referring to the Chinese New Year which falls on Feb. 16 this year. Official growth rates in a lower range would be uncharted territory for China's leaders, however, tempting them to spur growth with traditional stimulus measures. Gary Hufbauer, senior fellow at the Peterson Institute for International Economics, said China's government is likely to do whatever it takes to keep GDP growth rates from falling below 6 percent in the coming year, even if it means pumping up credit. "I think the judgment of the Chinese authorities is that the financial risk is less than the political risk," Hufbauer said in an interview. "They may be wrong but they certainly act as if a drop in the growth rate to a more normal level ... would be a political disaster," he said. In that respect, the forces at work in 2018 are much the same as those seen last year, despite Xi's consolidation of power since the party congress. While Xi's authority is unquestioned, it is unclear whether he will use it to throttle credit down, cut off loss-making enterprises, and face the consequences for jobs. The course of 2018 is likely to be determined by political calculations rather than promises of economic reforms as China faces its "three tough battles" of managing major risks, alleviating poverty, and controlling pollution.